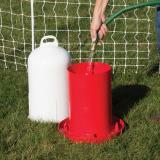 Double wall construction allows this waterer to be filled from the top (similar in style to galvanized top fill waterers). 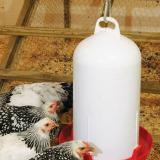 For watering all types of poultry. No more turning over to fill. 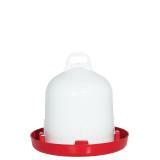 I love this waterer! It's so easy to use....just fill the inside well, secure the top and go! The handle on top makes it so easy to carry. Excellent waterer. Had purchased the 1.5 gallon size and they are excellent. So much easier to fill than the other ones I have had. 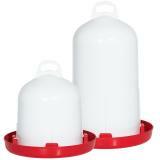 I already have two and just re-ordered one more and the 3 gallon size also. 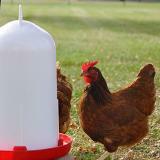 My chickens drink a lot of water. 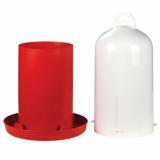 Great waterer. Easy to fill. You will have to hold your finger over the bottom hole. Would rate it five if you were able to get legs for the base. Still will probably get a second for outside. 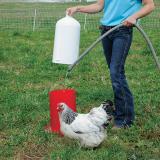 THE BEST waterer. 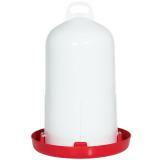 I wish it also came in a smaller size, but this is by far the very best waterer I have ever used. Easy to fill, no spilling. SUPER!